As you may have noticed, while searching for America in my travels, I have also sought out the odd roadside attraction. I’m a big fan of the “World’s Greatest, Biggest, Longest, Whatever”. One of my favorite websites and books is Roadside America. To me, it just seems like a crime to pass up a shot to see the “World’s Largest Frying Pan”, “World’s Largest Peanut”, the largest Paul Bunyan statue, the Airstream or Cadillac ranches, the peach tower, a giant tire, a huge ball of string, an elephant you can live in or use as a bar, a castle built from old used newspaper printing plates, etc. There is usually some fascinating history attached to them and some interesting, if not odd or unusual, person behind them. With this in mind, I set out to find Popeye in Crystal City, TX nearby. I found Popeye, twice. 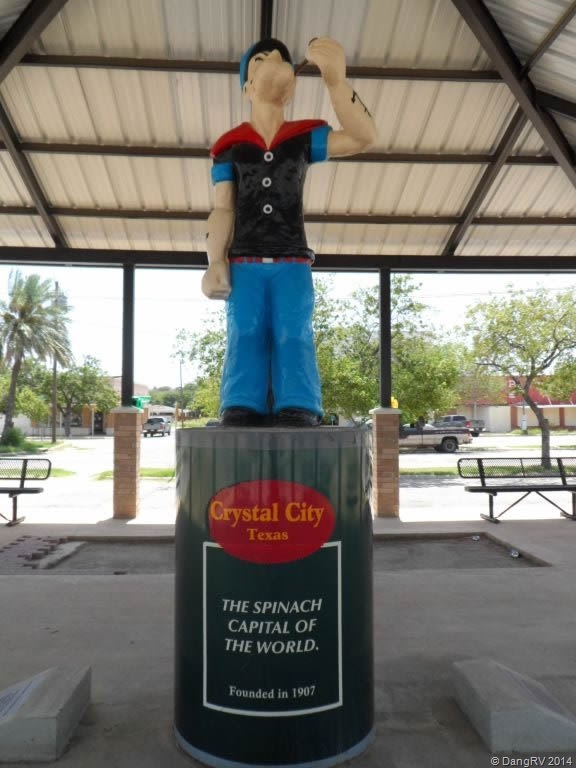 I first saw Popeye a year ago from a distance across from the H-E-B grocery store. He stands in a pavilion built on a spit of open land that divides the main thoroughfare from the side streets and old town stores. At the time, I was too busy to check him out but my curiosity finally got the better of me the other day so I Googled him. Popeye was the result of a contest in 1937. 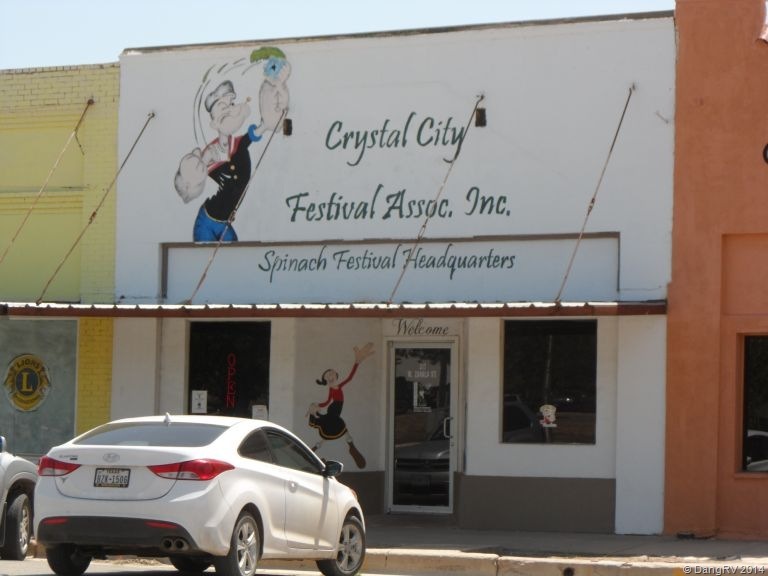 Being the “Spinach Growing Capital of the World”, Crystal City was looking for something to celebrate that and what better than the sailor who gets his strength by eating his spinach every day to promote it. I remember eating spinach as a kid only because Popeye ate it. The statue also honors the creator of Popeye, E.C. Segar who died under mysterious circumstances at only 38 years of age. Ah, but the statue I saw in the pavilion is not the original. It is a decoy. In a stroke of brilliance at a time when vandals and high school rivalries were damaging statues or making them disappear all together, the town had this copy made and put on display in a prominent place to lure them away from the true Popeye statue which stands in front of City Hall located two to three blocks away on a side street. I snapped pictures of both for you below. Near the “fake” Popeye is a storefront boasting the Spinach Festival. Oh boy! Can’t wait for that! I also spotted a closed down Popeye Buffet farther away and there is a Popeye Park about a mile away. 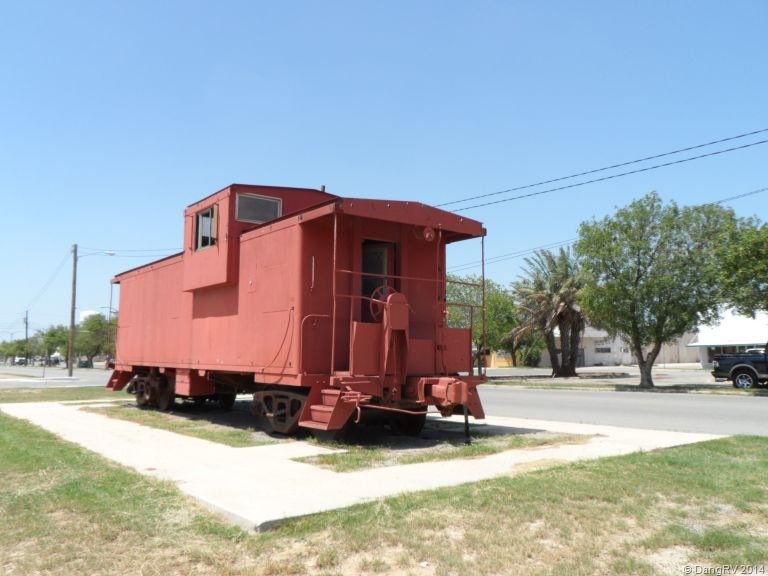 Just a few feet from the second Popeye statue pavilion is an old caboose as a reminder of the trains that used to run through town. 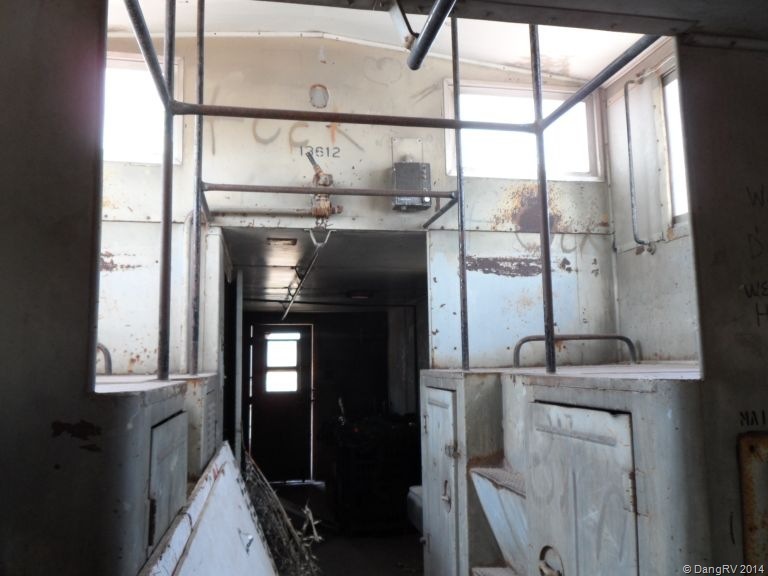 The caboose door is always open and the city stores some Christmas decorations in it. I went inside it and found the “IYamWhatIYam” geocache hiding in a magnetic key box. Woohoo! I love combining the fun of a roadside attraction with the fun of geocaching! Score! 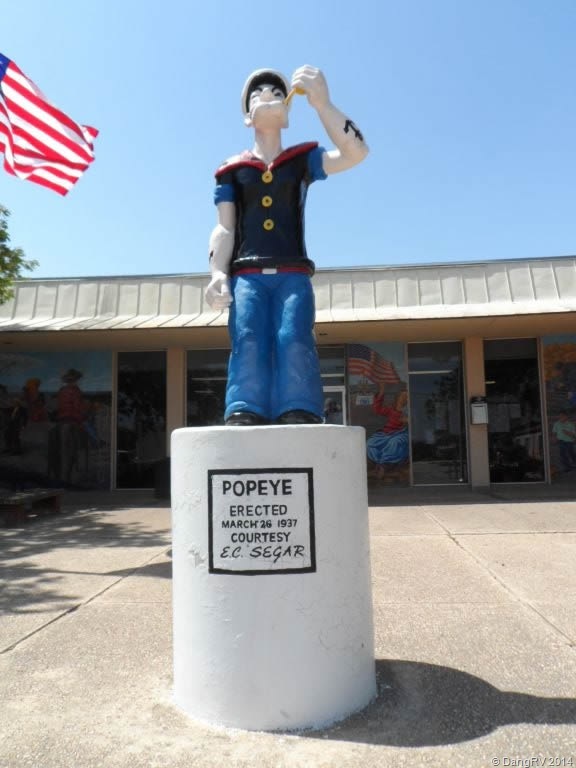 So that is how I spent my day searching for and finding Popeye in Crystal City, TX several times over.